^ Butler, Amy. "Last Raptor Rolls Off Lockheed Martin Line." Aviation Week, 27 December 2011. Retrieved: 17 January 2012. ^ "FY 2011 Budget Estimates." 互联网档案馆的存檔，存档日期2012-03-04. U.S. Air Force, February 2010. p. 1–15. ^ Reed, John. "Official: Fighters should be used for spying." Airforce Times, 20 December 2009. Retrieved: 9 May 2010. 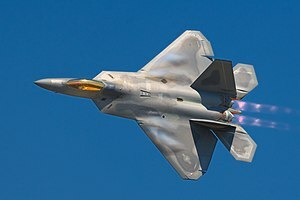 ^ "Why F-22?" Lockheed Martin. Retrieved: 10 November 2012. ^ Baron, Kevin. Gates outlines Air Force priorities and expectations. Stars and Stripes. 16 September 2009 [30 October 2013]. ^ Levine, Adam, Mike Mount and Alan Silverleib. "Gates Announces Major Pentagon Priority Shifts." 互联网档案馆的存檔，存档日期2011-08-11. CNN, 9 April 2009. Retrieved: 31 August 2011. ^ Serrie, Jonathan. "Last F-22 Raptor Rolls Off Assembly Line." Fox News, 13 December 2011. ^ Sughrue, Karen (producer), Lesley Stahl. "Is the Air Force's F-22 fighter jet making pilots sick? ", 60 Minutes, 6 May 2012. Retrieved 7 May 2012. ^ Butler, Amy. "Last Raptor Rolls Off Lockheed Martin Line." Aviation Week, 27 December 2011. ^ 美軍F-22戰機開始撤離日本嘉手納空軍基地. 星島環球網. 2007-05-10 [2011-01-11]. （原始内容存档于2011-11-13） （中文（新加坡）‎）. ^ 丁雨、張家齊. F-22進駐關島實戰氣氛濃 亞洲國家面臨空前威脅. 環球時報. 2008-08-03 [2011-01-11] （中文（香港）‎）. ^ 東北亞緊張 美F-22戰機群將駐沖繩. 中央社. 2010-05-21 [2010-05-22]. （原始内容存档于2010-05-23）. ^ 美军将在日本冲绳临时部署15架F-22隐形战机. 中国新闻网. 2011-01-09 [2011-01-11]. ^ Jay Miller. Lockheed Martin F/A-22 Raptor. USA: Midlsnd Publishing. 2005: 101. ISBN 1-85780-158-X. ^ Thomas W. Hampton. THE QUEST FOR AIR DOMINANCE: F-22—COST VERSUS CAPABILITY. USA: AIR UNIVERSITY. 1998: 20. ^ 20.0 20.1 Jeremiah Gertler. Air Force F-22 Fighter Program (PDF). USA: Congressional Research Service. 2012年10月. ^ R. Jeffrey Smith. 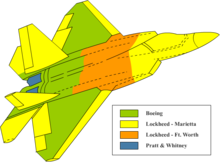 High-Priced F-22 Fighter Has Major Shortcomings. Washington Post. 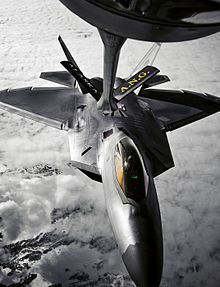 ^ The F-22 Raptor: Program & Events. Defense Industry. ^ 'Conclusive evidence' that F-22 pilot did not survive crash. CNN. 2010-11-19 [2011-06-26]. （原始内容存档于2012-01-21） （英语）. ^ Air Force grounds entire F-22 fleet. 空軍時報（AirForceTimes）. 2011-05-05 [2011-06-26] （英语）. 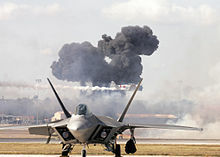 ^ F-22 crashes at Florida Air Force base. 福斯新聞網. 2012年11月15日 [2012年11月16日] （英语）. ^ F-22 fighter crashes in Florida, pilot unhurt. 路透社. 2012年11月15日 [2012年11月16日] （英语）.